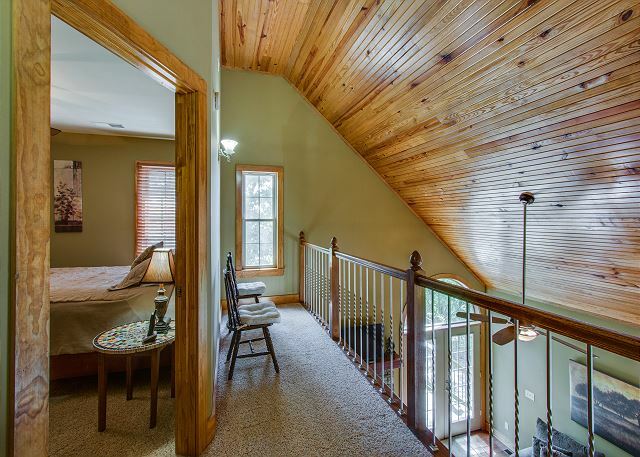 Sparta, Tn United States - Heavenly Rest | Center Hill Chalets Inc. This beautiful cabin sleeps 2-6. The name speaks for itself. Heavenly Rest has 3 bedrooms, 2 baths, hardwood floors, stone wood burning fireplace, large flat screen TV with satellite and DVD player, hot tub, gas grill, nice extended deck with lots of wildlife to enjoy, large kitchen, wine cooler, wireless internet service, and is located on a large private wooded lot. Johnson Chapel Recreation, Sligo Marina, and Ragland Bottom are only minutes away. A divine place to stay for a little heavenly rest. This is our third time at Heavenly Rest and the location fits the name. 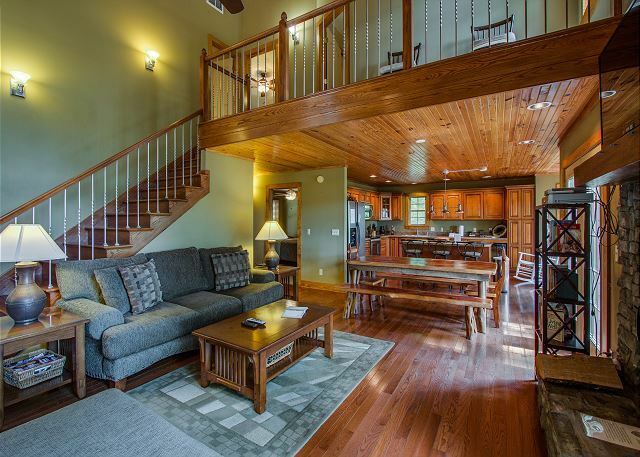 It is in a secluded location and has everything you need for a relaxing getaway. We live for the hot tub! I hesitate sharing how great this place is because I don't want everyone to know about it (ha)! The team at Center Hills Chalet are awesome too!! Always a pleasure to speak with them. Thanks for your wonderful review, Jodi. We are thrilled that you enjoyed your stay at Heavenly Rest. We hope you will stay again very soon!!! Three friends got together for a long overdue weekend of laughs and stories. The cabin was perfect. Truely appreciated the wood burning fire place and the hot tub. Bathrooms were great and same with the kitchen. Only degative was the couches need to be replaced. Which didn’t ruin our weekend in the least. Thank you for your review, Cathy. We are thrilled that you enjoyed your weekend at Heavenly Rest. Thanks for letting us know about the couches, I will pass that on to management. We hope you will stay again soon. Our entire experience was amazing. The home was clean, warm, and cozy. My husband, 20 year old son, and our 17 year old daughter enjoyed their own spaces in the home while the family living area was open and perfect for card games movies and meals, We hiked many of Tennessee's Amazing state parks during the day and then relaxed in the hot tub in the evening! Absolutely relaxing and exactly what I wanted for our family this Christmas, thank you! Thank you for your wonderful review, Jean. We are absolutely thrilled that you enjoyed your stay at Heavenly Rest. We hope you will stay again soon. We loved everything about the house and the beautiful location! The home was in excellent condition and spotlessly clean. We would consider renting again only if the knocking refrigerator is either fixed or replaced! That is more than a small nuisance, it’s very frightening in the middle of the night! Thank you for your review, Rita. We are thrilled that you enjoyed your stay at Heavenly Rest. Hopefully, the knocking refrigerator will get fixed so that you can stay with us again soon! This is our second visit to this beautiful home. The leaves were just beginning to turn and the weather was perfect for fall. We enjoyed the fireplace as wood had been left for us which was wonderful. The hot tub was an amazing way to relax each day. We definitely plan on coming back again. I would highly recommend this place to anyone looking for a quiet getaway. Thank you for your review, Jodi. We are thrilled that you enjoyed your stay at Heavenly Rest and look forward to your next stay. Excellent location, rooms, hot tub, and privacy. Would definitely recommend to anyone looking for a getaway! Thank you for your review, Brent. We are thrilled that you enjoyed your stay at Heavenly Rest! We hope you will come and stay with us again soon. Thank you for your review, Brad. We are glad you enjoyed Heavenly Rest; it certainly is the place to stay to be close to Sligo marina. We hope you choose to come back to stay with us at Center Hill soon! Such a charming place to relax and just enjoy who you are with. We are glad you enjoyed your weekend getaway at Heavenly Rest. It is a truly peaceful home. We look forward to your next visit! Thank you for your review! We really enjoyed our stay here. The cabin had everything we needed and it was the perfect layout. I would definitely recommend it and would stay here again! We are glad you enjoyed your stay with us and look forward to your return! Thank you for your review! My wife and I sought escape from a family get together 4 miles away that had four babies. Heavenly wet wet rest turned out to be fabulous. While there were only two of us, this could easily handle three couples in a delightful setting. The cabin is set up to feed a small army with a great kitchen and every Utensil, pot and pan ever needed. Feels like it was remodeled very recently. Tucked away in the woods, instructions to get there were precise. They even stocked birdfeeders to get the chickadees, wrens and titmouses to visit the back deck. We didn’t try the spa only because it was 27 degrees and we live in Florida. 15 minutes from a Super Walmart and Los Lobos, the best Mexican restaurant we’ve done in years - who knew!?! We will be back. Thank you for your review! We are glad you were able to escape away at and enjoy Heavenly Rest! It is certainly located in a convenient beautiful setting. We look forward to your next visit! Heavenly Rest was the best! We absolutely loved our visit. The cabin was perfect and we enjoyed our stay so much. We hope to be back! We are glad you enjoyed your stay at Heavenly Rest! Thank you for your review! We look forward to your next visit! The property was well maintained and in a beautiful location. View could have been better if trees were cut back. I believe it is on a river but we couldn't see it. The refrigerator makes a knocking noise that is a little disturbing as it sounds like someone is knocking at the door. Luckily this was noted on the refrigerator or we would have been a little spooked. The only thing missing was a bit of a homey touch - we couldn't find extra blankets, no available firewood for fireplace, etc. Bring your own DVDs, larger towels for hot tub (which was awesome), and wine opener. Overall, we loved the private location and the layout and condition of the home. We definitely plan on coming back. We are glad you enjoyed your stay. Heavenly Rest is actually on Center Hill Lake, however the wooded area does not a lot for a full lake view. Thank you for your suggestions. We are looking into them for future accommodations. We have firewood at the property for the wood burning fireplace. We look forward to your next stay! Thank you for your review! We have stayed in many, many vacation rentals and cabins. This was one of the best equipped, cleanest places we have ever been. The house is beautiful and they have literally thought of everything you could possibly need. We brought food and ice and we were set. It is pretty far out of town as other reviewers have mentioned but that's the point! A couple neighbors but plenty of privacy and a really pretty piece of property. We were pulling our 18 1/2 foot bass boat and it did take some acrobatic turning skills every time we came and went with the boat but nothing that you can't handle. If we come back to this area we will definitely be staying here again. This is a don't-miss vacation home. We are glad you enjoyed your stay at Heavenly Rest and that you were able to enjoy the peace and quiet that surrounds the outskirts of Center Hill Lake! We look forward to your next stay, and thank you for your review! House was really, really nice. Everything was neat and clean and ready for us when we rolled in. Get groceries befor getting there, just to save you time. Property is well maintained. Hot tub was good to go, clean too. Our stay was wonderful, the bed was very comfortable, hot tub great and the kitchen had every thing you needed. We are glad you enjoyed your stay at Heavenly Rest! This chalet is the definition of peace and relaxation. We look forward to your next visit! Thank you for your review! Great Time, nice House, well equipted, we will come again. Great compliment to Center Hill Chalets, it is absolutely easy and super friendly. Thank you for your review! We look forward to your next visit and are glad you had a great time! Everyone loved the chalet and had a great time. The kitchen was very nice and there was plenty of cooking equipment. We were boating on this beautiful lake. We plan to rent it again. We are glad you enjoyed your time at Center Hill. We look forward to your next visit! I decided I suppose my wife with a weekend get away with a few friends for our anniversary. I was not disappointed, we walked in to a very clean house which is always a good start. Nothing was broke in the house, everything worked the way it should( I have stayed in plenty of places that I could not say that about). Plenty of room for everyone to hang out and have fun on the big deck. Hot tub was very clean, I can't say enough good stuff about the place. My wife and a friend went running in the morning and loved the scenery around the house. I will definitely be keeping this place in mind for our next weekend we find a babysitter.!! We are glad you enjoyed your time! We look forward to your next stay! We spent 3 nights and 4 days and it was perfect for relaxing and escaping the craziness of Nashville. We felt at home the moment we walked on the door. We will be back for certain!!! We are glad you enjoyed Heavenly Rest and your escape away! We look forward to your next stay! Thank you for the review! We had a very nice trip. The home was very comfortable and completely functional. We enjoyed the hot tub very much. And we were able to park our boat which is very important to us. We are pleased you enjoyed your stay at Heavenly Rest! Plenty of parking and just minutes for the lake. We look forward to your next visit! The ease of booking and excellent communication by Center Hill Chalets made this a seamless, peaceful trip from start to finish. 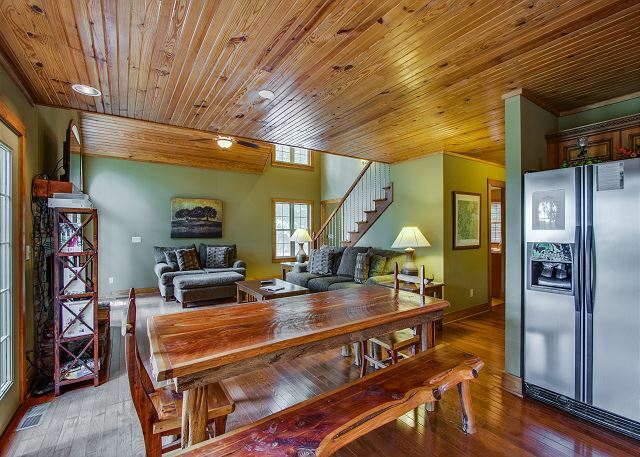 The house is beautifully designed, with modern amenities and a cabin feel. Everything was well maintained and clean upon our arrival. The beds were wonderfully comfortable and the living room furniture was excellent for long meetings and conversations. The setting of the house made for a peaceful, quiet weekend that was both restful and refreshing. I recommend this property for anyone wanting a problem-free peaceful weekend away from it all. Thank you for your review! We are very pleased you enjoyed your stay and we look forward to helping you with your future trips to Center Hill Lake! Nice fairly secluded property. Beds were exceptionally comfortable. Quiet location on a dead end road with almost no traffic during my stay. Kitchen was well equipped with nice appliances and lots of counter space. 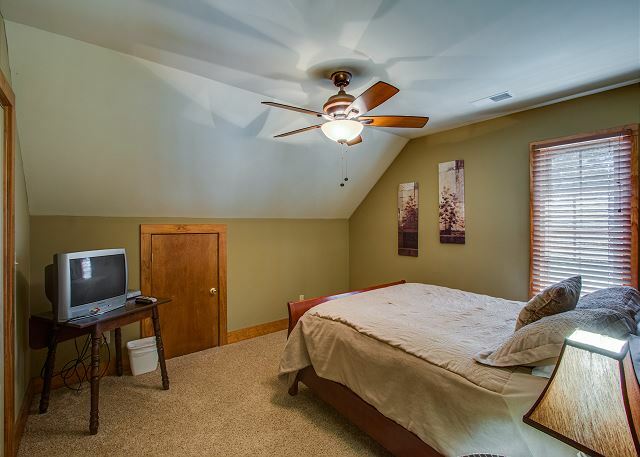 Master bedroom and bath on first floor with another large bedroom and a smaller one upstairs. Parking was no problem even with my supercrew long bed pickup. I didn't bring my bass boat but could have which is a problem to park on some properties. Large deck with comfortable chairs and the hot tub was in good condition. Lots of wildlife in the area. The staff was very nice on the phone. Your next visit give us a call and we can recommend some great places to put your boat in the water. Thank you for your review! We stayed two nights in this cabin and had a blast! The location is quite and private. We spent either most of our time on the deck enjoying the weather or at the dining table laughing and playing games. Kitchen was well stocked and everything worked perfectly. Would definitely recommend this cabin! Thank you for your review! We look forward to your stay again! We had a great time escaping for 2 nights to this cabin in the woods. It was very clean, and private. The hot tub on the deck amidst the woods was amazing. Will definitely be back! Thank you for your review! We are glad you were able to escape to Heavenly Rest and it was everything you had hoped for. We look forward to seeing you again. This property is immaculate and comfortable. The kitchen is well-equipped with one exception: knives. There is a large selection of knives, but they are so dull I couldn't slice an onion. I had to buy one the next day. Hot tub was great, amazing place to see the stars. We are glad you enjoyed your stay. We will get the knives sharpened for future stays. Thank you for your review. The cabin was wonderful. It had all the amenities we needed. The kitchen was well stocked. The location is easy to get to and street names visible. We are glad you enjoyed your girls weekend get-a-way and look forward to seeing you again! We loved the place, it was everything as we were told. Our kids enjoyed the hot tub and the birds that came to the feeders. My husband and I enjoyed just relaxing by the fireplace. It was so quiet and peaceful. We were looking for a busy touristy place and this one was perfect. We are gladyou enjoyed your stay at Heavenly Rest. It is definitely a peaceful place to enjoy. We look forward to seeing you again! We had a very pleasant Thanksgiving week visit. With the electronic lock there was no need to pick up or return keys, which made logistics a breeze. We found the house clean and had no problems with anything. We are so glad you had an enjoyable Thanksgiving visit! We look forward to seeing you again! Absolutely loved our stay at Heavenly Rest. It was exactly what we'd hoped it would be and we will definitely be back! We are glad you enjoyed your stay and look forward to seeing you again!! We were pleased with Heavenly Rest house, and the pictures are true. It was clean, and well- equipped. We appreciated the clean windows for the view out over! It even had bird feed to enjoy the birds, and we saw a pilated wood-******! We're recommending this place to others who are traveling down the same route regularly. I own a place in Riverwatch near this and need more room for a holiday weekend for family in town. Everyone love the home and were very comfortable. The flow was good for three couples who stayed there. Family weekend was restful and fun! the location was ideal since we had a boat reserved at Sligo marina. the cabin was luxurious, clean, lots of amenities. Owner worked with us when we had to reschedule even. We liked the Hillcrest cafe nearby for dinner and dessert one night. Anytime we are at Center Hill we have a wonderful experience. Along with good friends, our kids and good food. Water is always beautiful. The property was a good fit for our group. We have boats and parking was available. A few trees could be cut to make it just a little easier to park. Great Quite Cabin close to Smithville and the lake! We are pleased you enjoyed your stay and look forward to seeing you again! This is a beautiful house in a beautiful setting. Working with Center Hill Chalets was a great experience. The house was clean, comfortable and well appointed. It was a great experience overall. We enjoyed our stay at Heavenly Rest. There is no lake view but the quietness of the area was relaxing! It was clean and well kept. We enjoyed watching the birds at the birdfeeder on the deck. My husband booked Heavenly Rest for a getaway weekend he planned for me and my 3 best friends. We were incredibly impressed as soon as we walked through the door. The place was immaculately clean. We loved the open floor plan and beautiful view, although a view of the lake would have been nice. The outdoor area with hot tub was a perfect spot, day or night. We made multiple meals in the kitchen and were never left needing a tool or appliance. This home is fully-stocked with everything you might need. The master bed and bath is especially luxurious. Perfect for a gathering of friends or family! While you are there, venture to Burgess Falls State Park for a hike and picnic. There's even a park area down at the lake just a street away! We went for the seclusion and relaxation so we didn't see much of what was in the area, but felt we had everything we needed at the cabin. Casey. Thank you so much for your review. Please come and stay again with us. This is the perfect location for relaxation. Happy Valentine's Day, President's Day and Birthday! The cabin was very clean and the kitchen was well appointed. It was the perfect spot for us to enjoy our long weekend. We took long (frigid) walks, played games, read, watched movies, ate, stoked the fire and soaked in the hot tub. We enjoyed our time together as a family of four. Heavenly Rest was so comfortable and inviting. Alma, this home is the perfect little getaway for a family to enjoy some time together away on vacation. It is one of our top homes for small groups as well as a few others. Please come back and see us again. William, this is a great cabin in the woods for anyone to enjoy. We are happy that you had a great time and hope you return to stay with us. It was a great short trip for me and my boys! Great house and awesome river fishing! Mr. Taylor, We are so happy that you and your boys enjoyed your short trip to this nice home. We hope that your fishing trip was a memorable trip with lots of great fishing stories. Please make this a yearly tradition with us. Have a great day. This is our second time staying at "Heavenly Rest." It was the exact place for a break from the city. The view from the back deck is spectacular, especially in the fall. Everything is clean and in good repair. It is convenient to restaurants and state parks for hiking and exploring. The porch swing under the deck is a great spot to read while surrounded by nature. We will definitely return! Krista, thanks for staying with us and we look forward to you returning. This home is a great little place to stay for a nice relaxing getaway. We thoroughly enjoyed our stay at Heavenly Rest! It is remote feeling, but still close enough to town. The house was lovely and spacious and we had a blast! Sarah, thanks for staying with us and please come back. We really enjoyed the cabin and the excellent layout of the house. The open kitchen and living room was awesome! Really enjoyed the large deck and feeling of seclusion during our stay. Liesa, thanks for staying with us and please come stay again soon. This home is a great place to stay for relaxing! A great Time for the whole Family. Landscape, Nature, Wildlife. We arrive at night and everything went well, the whole discription from the managment via CHL Appand Email was great. My Wife and my two children (10 and 3 years old) and me were totaly flashed about the Equipment there was nothing missing that we Need for our 4 nighs Stay. The Whirlpool outside was great, also the swing at the porch. Fireflys,Deers,Racoon, are just a view friends that we met there. Sebastian, we are thrilled that you and your family had a great time at this lovely home. Please do return to stay with us again. One of the best 3 anniversaries we've had. Hagewoods' Happy Anniversary to you! We are happy that you enjoyed your stay with us in one of our nice homes. Please come back and stay again. My two brothers and I have taken a bro trip every year for the last 5 years and this was the nicest place we have stayed. We are happy that you are having a great time! We hope that you come back to stay with us again. Our family want to enjoy water sports and quiet time together. We were extremely pleased at the spotless grounds and immaculately clean inside as wek the kitchen had all amenities we needed and the hot tub and Jacuzzi were a plus. Quiet and in wooded area it was just a perfect stay. We will be a return guest!!! We appreciate you staying with us and look forward to you returning again. Thank you for the great review. Have a great 4th of July! Thanks for your nice review. Please come back and stay with us again. Great Place to Rest and get away! I have stay here twice and both times were great! Not to far from the lake, surrounded by the woods. Thank you, Justin. We are happy you had a great return visit with us. Rudy: Thanks for the review. We look forward to seeing you again, soon. I came down with my two daughters and a friend. The drive in to the cabin was beautiful. The countryside is just gorgeous. The cabin was great! The kitchen had anything you could need. The bedrooms and bathrooms are big and very clean. The hot tub was good too. The only thing I would like to change would be a light over the dining room table. It looks like there may have been one at one time but was taken out. Playing cards at night would have been easier with a light. We hope to come back, would definitely recommend to anyone. Merri Thank you for the review. We're glad you had a great time. Come back and see us soon. We love this house. This is the 2nd time we have stayed time we have stayed here. It is located close to Sligo Boat Dock. Although it doesn't have a direct view of the lake, if you are looking to get away to a peaceful destination a short drive from Nashville, this is it. The road going in is pretty level for Centerhill. We had a great time in a very nice house, could not have asked for a nicer place to stay. Had everything you would ever want in a weekend getaway. I highly recommend this place for weekend or a entire week. Had a great time. It was absolutely beautiful staying here. The house is gorgeous and well equipped with everything and anything you possible need. The only thing that made it a little less then PERFECT was it did not have window coverings which made it feel a little lacking of privacy. The bedroom and bathroom had window shades but completely see through. Other then that we would definitely recommend 100% Heavenly Rest if you are looking for a peaceful, serene and relaxing time off. My two best friends and I have been here twice now for our annual girls' weekend. We absolutely love this cabin. We have everything we need right there! The property is immaculately clean which is important to us. Everything in the kitchen is so well organized and nothing is left out. We cook at the cabin so this is very helpful. I can't see us choosing anywhere else to stay! Thank you for your review, this Cabin has been one of our staples at Center Hill Chalets. And is consistently among our customer favorites. We look forward to seeing you and your friends back soon. Heavenly Rest Chalet is a very attractive and welcoming place to spend a winter vacation. The fireplace provided the touch that is needed for a Christmas week for a family. The family included Grandpa, three of his grown kids and five of his seven grandkids. No, they didn't all stay in the Chalet since two of my kids live in the area. We got together a couple times in the Chalet and a couple times at my daughter's place. I will list a few things that would help make the house a bit more comfortable. I will also list a few items that were not in A-1 condition which we did NOT do. The front door instructions for opening the door were not correct. Thankfully, my son had experience with that kind of locking system and we learned from that how to get in. ..The house needs a bit better lighting. The worst was over the table. ..There was no chair in the master bedroom. We stole one from upstairs. ..Also, there was no waste can in that room. ..The upstairs bathroom exhaust fan did not seem to work very well. ..One roll of TP in each bathroom is a bit skimpy. ..The "bars" of soap (if you can call them that) are also a bit skimpy. Then items that had some damage: One cup was cracked to the point of not holding liquid. There were dents in the freezer door. The island stools had screws missing and until my son fixed them, they could have been dangerous. A beige cereal bowl had a chip in it. Otherwise, a nice place. The home was beautiful and the stay was everything we needed. We were extremely satisfied with the rental. It was VERY clean, in a perfect setting, and it was everything we were hoping for. We will be staying here again. We rented this to get away with friends for the weekend and it was wonderful! Kitchen was well equipped, beds were comfortable, and the setting was beautiful and relaxing!! LOVED this home and everything it had to offer. Was exactly as described. Was a perfect weekend get away. We enjoyed every aspect of our stay. Cannot wait to return! We had a girls weekend at this home and it couldn't have been better. Just a quick drive up the road from the lake where we took our kayaks, and a 25min drive to burgess falls for some hiking. The house was beautiful and very clean. We were looking for a small cabin in the woods and ended up with this gorgeous home. The hot tub was great and all the beds were super comfortable. Thanks for a great stay. Very nice accommodation . Very clean. Very cozy and quiet. Close enough to Smithville for supplies. We would rent it again. Recommend to all who stay here to bring some basic spices with you for cooking meals. This rental property is correctly named Heavenly Rest. 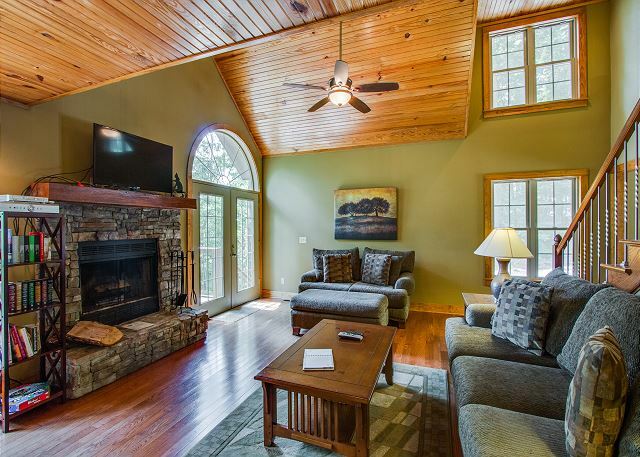 It's a beautiful home surrounded by nature with all of the modern conveniences. A beutiful kitchen stocked with everything you need, the bathrooms are big and spacious, and the beds are very comfortable. We look forward to coming back again soon. We enjoyed the comfy couches and just relaxing away from everything! My wife & i spent our 1yr anniversary here & we loved the home & it's beautiful surroundings.. wish we could have seen the lake in the view but hot tub made up for it. Our family had a wonderful experience at Heavanly Rest. Everything was so clean, and the beds were fabulous. In the kitchen, anything and everything we would need was provided for us. It was far enough away from everything and yet close enough were you could run to the store (Walmart) if you needed to. The only issue we had was with bees/wasps. We had to purchase spray so we could open all the doors to enjoy the scene. But that is nature, and sometimes you just have to go with it or adjust. We will visit again and look forward to our away time. This was a beautiful cabin. Very clean and well appointed. You don't have a view of the lake, but if you want a nice place to get away, this is a great place. The roads getting into the cabin are better than most in the area. We would definitely recommend it. Heavenly Rest is exactly as the name implies. We had a wonderful weekend and did not want to leave this beautiful home. It was extremely clean and well stocked. The kitchen had more appliances than I do in my own home. Can't wait to return. Wonderful weekend getaway! My husband and I enjoyed every aspect of our stay. The cabin, along with the many wonderful amenities, exceeded our expectations. We had a great weekend and we will definitely return for another stay! We had a wonderful time. The properly we clean, well appointed but not cluttered. We went with friends for a weekend of relaxation and downtime and that is exactly was we got. It was quiet, lovely sunset over the ridge, and great kitchen (both couples enjoy cooking). We greatly enjoyed our stay. We had a great time at the house. It was very quiet and private. Floor plan is very open with lots of natural light. The kitchen was very well stocked with pots, pans, etc. We especially enjoyed the hottub! This is a beautiful home and we would definitely stay here again as well as recommend it to other people. We have stayed at this cabin once before. It was just as clean & beautiful as we had remembered! I am VERY picky, I notice everything..... There is not one thing I would have changed about our stay!It even had two juicers to choose from for our morning breakfast. Will go again soon! We had such a great time in this cabin. It is a wonderful getaway for us. We met a couple of the neighbors and they were very kind as well. I recommend this location highly and will definitely be booking it again. I enjoyed Heavenly Rest and would recommend this to others. There was a slight smokers type smell when I walked in to the home. Overall, the house is great and the privacy it offers is wonderful. Lovely, stylish property . Bathrooms are great. View is very nice--mostly wooded. Large deck with plenty of seating and an area to eat outside. Nice gas grill, but bring matches. Great for relaxing and hanging out. Short trip to the lake for boating and swimming area. Furniture is nice and very clean. TV's in living room and all three bedrooms. Washer and dryer very nice--watch your head by the dryer. Not a place for small children-or older folks who sleep upstairs-stairs are very steep and slippery. Deck was plagued with wasps--bring spray. 22 month old got stung-ugh! Deck also has slivers-bring tweezers or never take off your shoes out there. Yard is non-existent, so no games outdoors. We walked up and down the road and looked at the beautiful homes and saw lots of wild turkeys. Bring lots of Off-mosquitoes and chiggers abound. Hot tub nice feature, but needed cleaning. Refrigerator had been cleaned before arrival (Good! ), but was warm when we got in with a ton of food. Note on frig says wait a day to buy perishables---too late for that. I know these may seem petty complaints, but perhaps they will save someone else some of the issues we experienced. Wonderful place to stay! Close to marina, very well stocked kitchen. Plan to return! This property was very clean and appeared to be new. It had all of the features that one would want for a vacation rental. It is located very close to Center Hill with a boat ramp just down the street. Very nice and close to Sligo Marina. Our group would love to go again. One of my favorite properties. Until renting this property I had never stayed on this end of the lake (Sligo Marina Area.) I found it a lot easier to get in and out of Smithville, not an extreme amount of back roads like some of the other cabins. My only complaint was the very faint smell of smoke in the house, otherwise my favorite property to rent thus far. Thank You Robert. We had a small fire in the chimney over the winter, I appreciate your feedback and will have the smell looked into. This was our first time to this area and we thoroughly enjoyed it. We needed a good family getaway and Heavenly Rest was the perfect place for us. We found the cabin charming and the area soul refreshing. Note for the management company: we have small kids and we unable to give them baths because the plugs for the drains in both tubs do not work. Also we could not find a sharp knife in the house which made meal prep very difficult. My wife and I stayed there 3 weeks ago when it snowed a little. It was gorgeous. We had a wonderful time and loved everything about the spacious cabin. We cooked our own meals and had long soaks in the hot tub as the snow fell. It was wonderful. I would HIGHLY recommend this to anyone considering it. BEST CABIN EVER! We had a great time. Loved the cabin and the hot tub! We had a few issues with the drains in the bathtubs and a toilet running/overflowing, but it was fairly minor. The inside stairs were VERY slippery. We made sure not to wear socks when walking down them. Hard to believe, but Heavenly Rest actually looks better in person than it did in the photos! The kitchen is nice and spacious, the fireplace is wonderful and the beds were really comfortable. Highly recommended! Wonderful stay enjoying the fireplace and peaceful outdoors. If you are looking to get away from the hussle and bussel and want to listen to the cracking fire this is worth every penny! The house at River Watch was great. Great expeience.Sherry was very helpful and even helped us get set up and in the house on Thanksgiving!!!! She took time off from baking pies for her family. 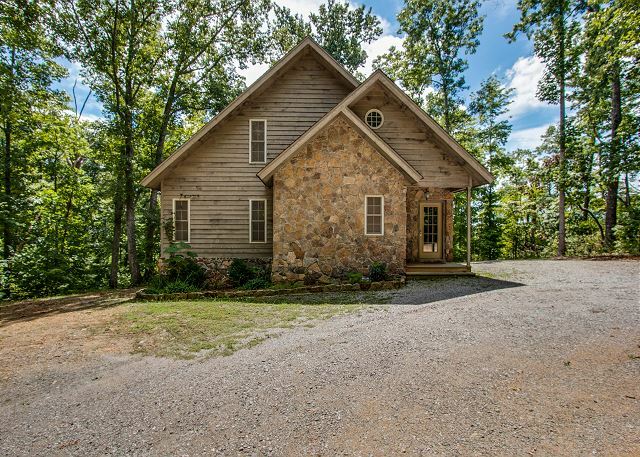 We were originally staying in a 5 bedroom cabin with 10 people, but the air conditioner stopped working and we agreed to move into this 3 bedroom, 2 bath cabin (no 4 or 5 bedroom cabins available). The cabin was very nice, just a bit cramped for 10 people. This is our fourth rental with CHC and it gets better every time. This is the best property we have rented and we intend to rent it again next year. As always it was an all around 5 star experience. Center Hill Chalets are the best folks to work with. Great property and wonderful people!! It was a pleasure to meet you both, and I'm glad we were able to help you get some much needed time away. We look forward to seeing you again soon. Robin Driver Owner Center Hill Chalets Inc.
House was stocked with everything you need kitchen wise. Much more than most. Property management excellent service.